There's nothing like a good underdog story. Aside from last year's failed Vox tablet, Kobo has made some quality devices, but has still failed to make a huge dent in the e-reader market -- a space dominated by Amazon and Barnes & Noble. 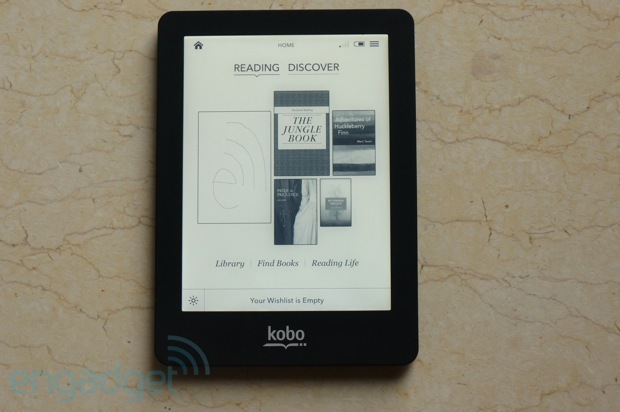 In the case of the Glo front-lit e-reader ($129), Kobo might just be hampered by unfortunate timing. 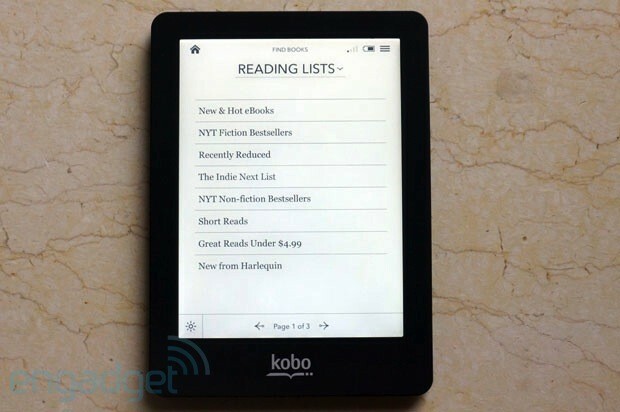 Though the company managed to get a jump on things in the last round with the Kobo Touch, the Glo comes on the heels of similar devices, the Nook Simple Touch with GlowLight and the Amazon Kindle Paperwhite. But, could this reader have what it takes to convince Kindle and Nook owners to take a leap of faith? Find out after the break. Kobo's got a solid e-reader on its hands, but the company may have already missed the boat. How would you rate the Glo? We want to hear what you think. Post a quick review now to join the conversation! The more things change, the more they stay the same -- or, as far as e-readers go, the more things change, the more they begin to look like each other. As standalone readers continue down the path toward buttonless, touchscreen devices, it's getting more and more difficult to distinguish the competition. Sure, Kobo hasn't made much in the way of radical design alterations since the days of the Touch, but it has made a few tweaks to the front of the reader, dropping the home button on the bottom bezel, and replacing it with the lower-case logo. Those changes are enough to make the device a dead ringer for the recently released Kindle Paperwhite, especially if you buy it in black. Upon closer inspection, there are some key differences, however. 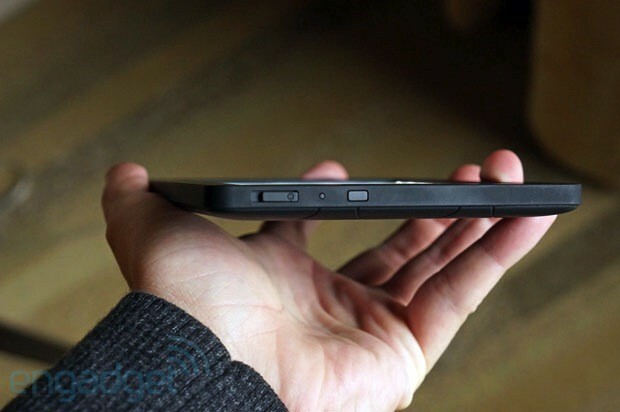 For starters, there's the fact that Kobo's managed to pull off a slightly shorter, skinnier form factor, at 6.4 x 4.5 inches (down from 6.5 x 4.5 on the Kobo Touch). That compares to the Paperwhite's 6.7 x 4.6 inches, though it does make up a little bit of that footprint with a 0.39 inch thickness to Amazon's 0.36 inches. More impressive is the fact that Kobo has managed to keep the reader's weight down; it's the same 6.5 ounces as the Touch -- not too shabby compared to the 7.5-ounce Paperwhite and 6.95-ounce Simple Touch with GlowLight. When you're holding a device like this for long stretches, every ounce counts. But while Kobo scores points for keeping its device so light, this reader just doesn't possess the same build quality as its competitors. All of the physical buttons now live on the top of the device. There's a switch for power / waking the device from sleep. To the side of that is a small rectangular night light button. 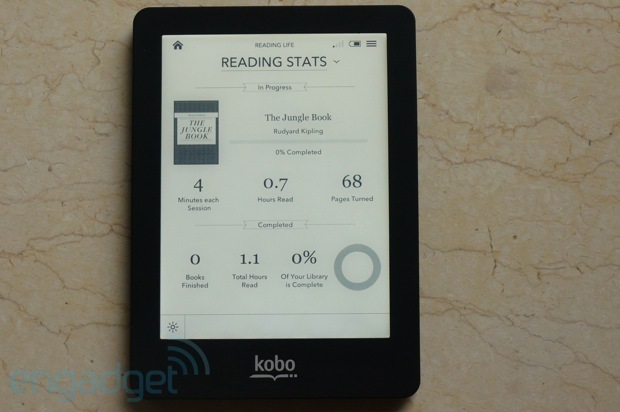 Kobo's bucked the trend by incorporating a physical button for turning the front light on and off. It's tough to say which method is better. Ultimately, it comes down to personal preference -- we can't say we strongly prefer one way over the other. We'd much rather have the physical page turn buttons of the Simple Touch devices, but Kobo left those in the dust a couple of generations ago. And while you use a physical button to turn the light on and off, the dimming process still occurs entirely on the touchscreen. Nearby is a small indicator light that will flash green as the device boots up. On the left side of the device, you've got a microSD slot, which lets you expand the device's built-in 2GB of storage to a max of 32GB. Such concerns are perhaps rendered moot in this age of near-ubiquitous cloud storage (Kobo Everywhere, in this case), but it's always a welcome feature. 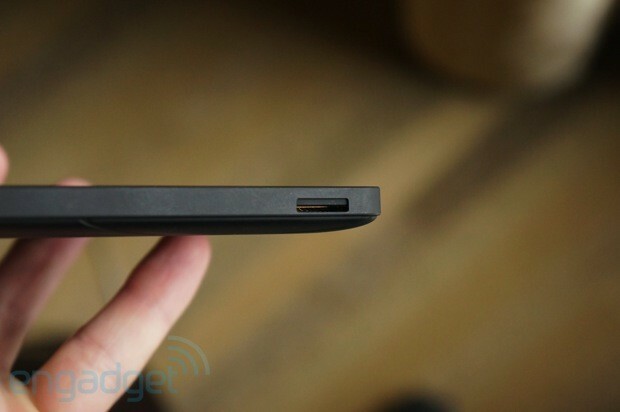 On the bottom, there's that micro-USB port. 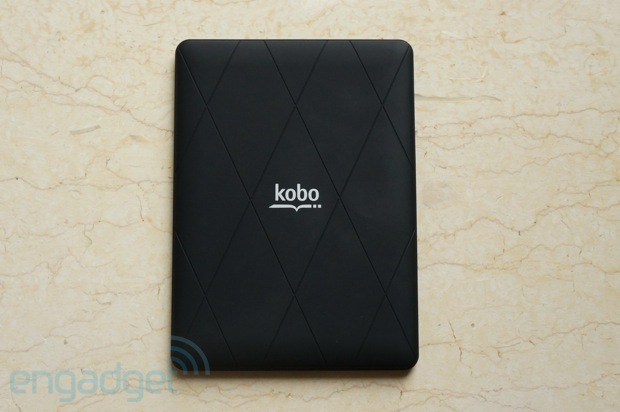 The back, naturally, maintains the diamond pattern -- it wouldn't be a Kobo device without it. It's been toned down a bit here, though, bringing it in line with Kobo's other new devices. (It doesn't offer up much more traction to help prevent slippage.) Interestingly, the back plate peels off, should you need to swap out batteries or just take a nice long look at the internals. In our case, we had to pry it off to find out why the reader had a strange rattle to it. Turns out, the battery had become unseated during shipping. 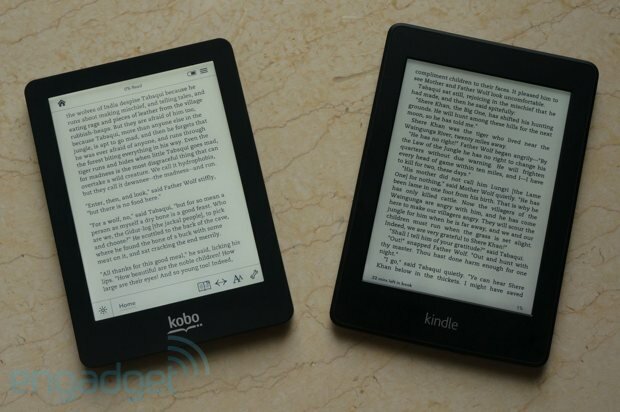 The entire reader is coated with the sort of soft-touch material you've come to expect on e-readers and other devices. Kobo's selling the device in black and grey, as well as brighter pink and blue options. We're pretty happy we got stuck with classic black, but the different choices should appeal to some buyers. On the whole, there's not much in the way of excitement as far as the hardware design goes -- particularly now that we've already handled the similar-looking Kindle Paperwhite. As such, most of the qualms we had about the Paperwhite's form factor carry over here -- neither is as nice to hold as Barnes & Noble's Nook products. However, Kobo get points for managing to keep the weight down. When the Nook Simple Touch with GlowLight went on sale earlier this year, we were quite impressed. 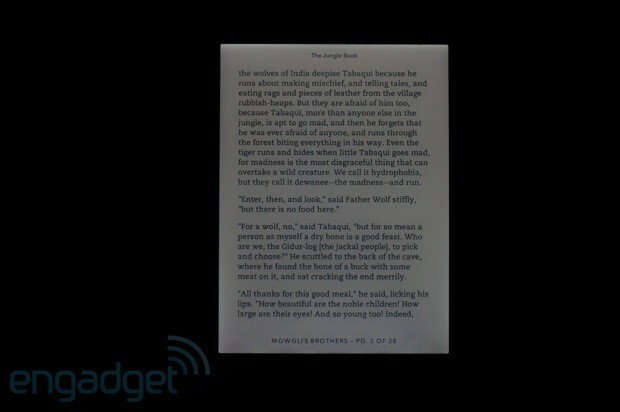 The reader showed promise for front-lit E Ink displays in a way we hadn't seen. When the Kindle Paperwhite launched just a few months later, however, Barnes & Noble's proprietary technology already seemed dated. Amazon's own approach to front lighting, reportedly four years in the making, offered up a much whiter and far more evenly distributed illumination across the screen. So, how does the Glo fare after the arrival of the other two? Quite frankly, the company hit front lighting out of the park on its first try. The Glo has even more in common with the Paperwhite on that front, with great light distribution across the display, devoid of any uneven splotches. According to Kobo, that's thanks to a "nano-printed fiber-optic film" -- a technology that sounds awfully similar to the one implemented by Amazon. Even turned up all the way, it's tough to tell precisely where the light is coming from (if you tilt it and look hard enough, you can see the source under the bottom bezel). All told, that's a big improvement over the Nook's easily detected light. And like the Kindle, there's none of the blueish overcast present on the Simple Touch with GlowLight. If we're picking nits, there is a slightly perceptible yellowish tinge here, which you can see when you hold the reader up against the Paperwhite. On the whole, though the page looks far whiter than standard e-ink with the light at full blast. As nice as the front light is, however, there's a strong downside to Kobo's implementation -- text contrast suffers noticeably. Reading with the light off, there's not a lot of difference between the Paperwhite and Glo -- turn the light all the way up, however, and it becomes far more pronounced. Though text contrast feels somewhat compromised, the company has added features that allow you to adjust the sharpness and weight of the text. Bold it up too much, and the quality of the text degrades, particularly when compared to the Paperwhite's default setting. We noticed a few instances of text ghosting, but all in all, not too bad. By default, too, you'll get a full refresh every six pages. Interestingly, there's an option for changing the frequency, though we can't imagine anyone wanting their Kobo to refresh more often. Those upgrading from the Kobo Touch will find the Glo's interface familiar. The centerpiece of the home page is a collection showing covers of your recent reads. Just above this are Reading and Discover buttons, which let you toggle between the reading pane and another that offers up recommendations. There's no particular reason that feature couldn't have just been relegated to the store, but Kobo clearly wanted to make it as simple as possible for you to spend some money on Dean Koontz books. Along the top of the home screen are icons for home, battery life and a settings drop-down that offers up the date and time, a WiFI checkbox, more precise battery life reading, search and a notification showing the last time you synced your content to the cloud. Below this are links to your Library, the Store and Kobo's Reading Life social network. Along the bottom is a link to your reading "Wish List" (which you can populate while shopping). Clicking Library will give you refinement options, letting you view by Books, Newspapers / Magazines, book previews and shelves, which you can build from locally stored content. Library sections are organized in a straightforward matter, listed with a small cover image, name, author, the percent you read and file format. To the right, a button lets you open the book (you can also accomplish this by simply clicking on the book, naturally), view more info on the title, delete it from your shelf or find similar books -- yet another spot for some e-book upselling. Reading Life is Kobo's attempt to make reading more social and fun -- if you're going out and buying your own e-reader, however, we assume you're already at least somewhat convinced that reading is entertaining. This feature, which was also present on the Touch, lets you know how long you've been reading, how many pages you've read, the number of books you've completed and the percentage of your library you've made it though. The service serves up goofy little trophies for your activity, some number of which require no effort whatsoever (think: "BookLover," which you get for buying a Kobo reader). There's also a Facebook award you can score when you link your Facebook account, if you're the sort of person who needs to tell the world what you're reading. On the Extras, accessible via the settings, you'll find some games (chess and sudoku) and a sketchpad that lets you use the touchscreen to make notes and draw pictures with your finger. At the bottom of that page is a link to the web browser, continuing the proud e-reader tradition of completely hiding the feature away. There's a reason, of course -- the current e-ink technology is simply not built for web browsing -- the page refreshes a lot during scrolling, images don't look great and in the case of the Kobo, there's no pinch-to-zoom, so you've got to rely on an ever-present slider on the bottom to make things larger. That said, it's there if you need it. The reading experience is fairly straightforward, too. By default, the page is monopolized primarily by text. At the top, you get the book's title, and along the bottom is the chapter number and your progress in that particular section -- we'd have preferred a more basic page number, but to each his own. Clicking on the top right will dog-ear the page for a bookmark. Tapping and holding on text will underline it, offering up a window with a definition courtesy of Merriam-Webster. Along the bottom, you'll get options for adding a note or highlight, translating, searching for instances of the text throughout the book and positing it to Facebook. Click the bottom of the display and two toolbars will appear. Along the top you'll see the home button, the percentage of the text you've read, battery life and a button for settings. Along the bottom are buttons for brightness (which only appears if you've got the light turned on), page progress (via a slider), text format and additional features. Click on the format button and you'll find 10 font styles and sizes to choose from and various options for line and margin spacing. Once again, Kobo has produced a solid little reader. The Glo's got the features that helped make the last-generation Touch a nice device, this time coupled with a front-light technology that might well be the best in its class. The UI is nothing to write home about, Reading Life isn't quite the selling point the company seems to think it is and it's still not as comfortable to hold as the Nook Simple Touch with GlowLight. And then there's the fact that the reader's coming to market after a nice headstart by Amazon and Barnes & Noble, both of which are priced $10 less (with ads, in the case of the Kindle Paperwhite). Still, the Glo's bright, evenly lit display provides for a great reading experience, making it worth considering despite the premium.